The final Raw before Elimination Chamber takes place in Grand Rapids, Michigan tonight. 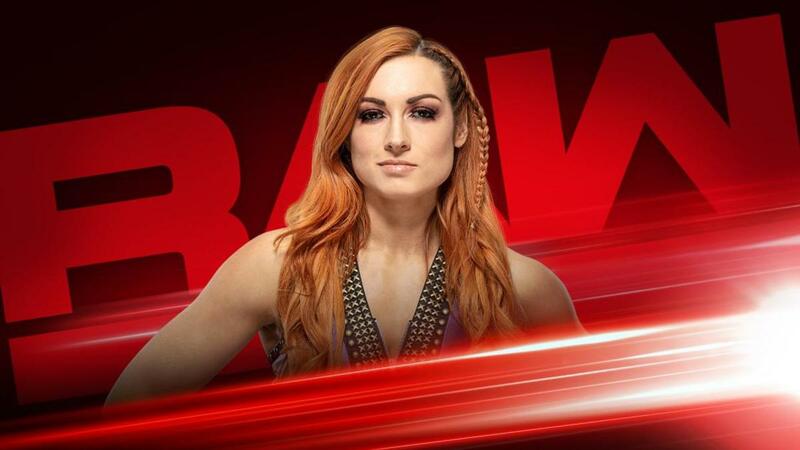 The McMahon Family has invited Becky Lynch to appear on Raw for the second straight week. Last week, there was an angle where Stephanie McMahon suspended Lynch because she’s refusing to see a doctor for her injury. Lynch didn’t like that and punched her. The next night on SmackDown, Lynch had a confrontation with Triple H and slapped him. Raw Women's Champion Ronda Rousey was unhappy that Lynch has jeopardized their WrestleMania match. That led to Rousey destroying Riott Squad members Liv Morgan and Sarah Logan. Rousey defends against Ruby Riott at Sunday's PPV. Tonight, Rousey and Riott are both scheduled to appear. Seth Rollins returns tonight after being attacked two weeks ago. Universal Champion Brock Lesnar gave Rollins six F-5s the night after Rollins won the Royal Rumble. Rollins is set to challenge Lesnar for the title at WrestleMania. Our live coverage begins at 8 p.m. Eastern time. Triple H and Stephanie McMahon were already in the ring to start Raw. McMahon noted that they’re on the Road To WrestleMania but make a stop at Elimination Chamber. She noted the first ever Women’s Tag Team Championship will be crowned Sunday. Triple H mentioned WWE Champion Daniel Bryan defending against 5 other guys in the Chamber match as well. They then turned their attention to Raw Woman’s Champion Ronda Rousey. If she can beat Ruby Riott Sunday then she goes to the WrestleMania main event. They then showed footage of Lynch’s confrontations with McMahon and Triple H. McMahon noted Lynch did she her doctors. She was about to reveal their decision when Becky Lynch interrupted. On commentary, Micheal Cole pointed out that Lynch has confronted Rousey at live events as well. The fans broke into a loud “Becky” chant. Triple H revealed Lynch saw her own doctors and not the WWE doctors. Regardless, they agree and Lynch is cleared to compete and will face Rousey at WrestleMania. Of course, there’s a catch. Lynch as to apologize. The suspension is lifted and Lynch gets the main event as long as she apologizes to Triple H and McMahon. They just want her to say she’s sorry. McMahon told her not to be stubborn but Lynch told her to shut it. Lynch doesn’t trust them or her old man. She noted the McMahon’s have been screwing people over for years. She said she’ll fight them and she’ll fight the old man. Lynch refused to apologize and went to leave. McMahon got in her face but Hunter broke it up. He gave Lynch a choice to make by the end of the night. She can apologize and face Rousey at Mania or throw it all away. The losing team enters the Elimination Chamber match first. The other team will be determined tomorrow night on SmackDown. Jax and Tamina were firmly in control. Liv Morgan tried to tag Banks or Bayley but they dropped off the apron. Tamina and Jax isolated Morgan and slowed the pace down. Morgan fought back against Jax and went after the leg. Bayley made the blind tag but Jax ran her down. Ruby Riott and Sarah Logan attacked Banks on the floor. They sent her into the barricade and Logan rocked her with a knee. Officials and doctors checked on Banks at ringside. Eventually, the doctors took Banks to the back leaving Bayley on her own. Bayley tagged Morgan and Logan pulled Bayley to the floor. Tamina attempted a splash but Logan got her knees up. Bayley tagged herself in and ran wild on Morgan. She hit the sliding dropkicks on Morgan and Jax. Bayley caught Morgan with a knee and followed up with an elbow drop for a close near fall. Morgan used an inside cradle for a two count. Bayley hit the Bayley-to-Belly on Morgan but Tamina rocked Bayley with a superkick. Jax tagged in and used a Samoan drop on Bayley for the win. This means Bayley and Banks enter the Chamber match first. In the back, Becky Lynch was walking backstage when she saw Elias. He’s preparing to perform next. In the ring, Elias was about to perform but Becky Lynch appeared on the big screen. Lynch spoke with Finn Balor backstage. He gave her some advice and basically told her to apologize. He promised to defeat Bobby Lashley and Lio Rush Sunday for the Intercontinental title. Balor said he’s seen pride bring down many men but told her to not let it bring down The Man. Back in the ring, Elias was about to perform when a video package on Seth Rollins started to play. In the ring, Elias began to perform when The Lucha House Party interrupted. Back from commercial, Elias was furious with all the interruptions. The worse part is his album wasn’t nominated at the Grammy’s. He wondered why The Lucha House Party was out there. Kalisto noted they want to entertain the WWE Universe. However, tonight they want to walk with Elias. Elias started singing his song, which buried Grand Rapids. Lucha House Party wasn’t impressed and gave him thumbs down. Elias was mad and wondered if they could do a better job. Kalisto sat on the stool and played the guitar. In fact, he was pretty good. Elias was impressed and asked to do a duet. Elias grabbed his other guitar and hit Kalisto from behind. Intercontinental Champion Bobby Lashley and Lio Rush watched the match from ringside. McIntyre jumped Balor to start the match. He was firmly in control and worked over the arm. Balor and McIntyre ended up fighting on the apron. McIntyre missed a charge and hit the ring post shoulder first. Balor attempted a dive but Lashley tripped him up. Balor rocked Lashley and Rush with a sliding dropkick. He hit the sling blade on McIntyre and climbed to the top. Lashley pushed Balor off for the disqualification. McIntyre and Lashley beat down Balor after the match. Kurt Angle ran out for the save. He was on fire until Baron Corbin ran out and attacked Angle from behind. Braun Strowman then ran out for the save. Strowman took out Lashley and McIntyre on the floor. He went after Corbin but McIntyre pulled him out of the ring. The match was made official during the commercial break. The faces had the early advantage. They isolated McIntyre in their corner. The heels took back over by isolating Balor in their corner. Angle got the tag and hit the rolling German suplexes on McIntyre. He hit the Angle Slam for a close near fall. The heels regained control and cut off Angle from his side of the ring. Balor got the tag and took down Corbin. He attempted the sling blade but Corbin caught him with a chokeslam backbreaker for a near fall. Balor almost made a tag but Corbin knocked Angle off the apron and McIntyre pulled Strowman off. Strowman tried to chokeslam Corbin on the floor but McIntyre nailed Strowman with the Claymore Kick. In the ring, Lashley missed a charge in the corner and Balor hit a dive to the floor. Balor went to the top turnbuckle but Rush jumped up on the apron. Lashley slammed Balor off the apron. Lashley scored the three count but Balor’s foot was on the rope. A second referee came out and informed the first referee. The referee decided that this match continues. During the commercial break, McIntyre rocked Strowman with a Claymore kick that sent him over the barricade. Balor has no one to tag and battles the three heels on his own. Balor crawled to his corner and Strowman made it back to his feet. Strowman got the hot tag and ran wild on the heels. Strowman ran down Corbin, McIntyre, Lashley, and Rush at ringside. Corbin tried to stop Strowman but Angle nailed him with a German suplex on the floor. Strowman caught Lashley with the power slam. Balor then hit the coup de grace on Lashley for the win. Kevin Owens sent in an update to the WWE Universe. He noted he spends his time with his wife and kids. They were at bowling alley enjoying their time together. He’s been watching Raw but it’s been hard to watch people do what he wants to. However, he’s about a month away from returning. He doesn’t know if it’s Raw or SmackDown but it doesn’t matter. He then bowled a gutter ball to end the video. Charley Caruso interviewed Becky Lynch in the back. She asked Lynch what she’d say to the fans if she took away the match with Ronda Rousey by not apologizing. Lynch didn’t have time for Caruso and walked away. Cross had the early advantage and hit a cross body for a near fall. Riott fought back and sent Cross face first into the turnbuckle. During the match, Michael Cole noted there’s a confrontation in the back. It cut to the back and Ronda Rousey approached Becky Lynch. Rousey told Lynch this is bigger than them. She told her it’s time for her to man up. Rousey noted if Lynch says anything but sorry she’s just admitting she’s too much of a coward to face her. Back to the match, Riott was firmly in control and scored a two count. Cross hit an inverted DDT on the apron and followed up with a crossbody off the apron. Cross trapped Riott in the ring skirt and nailed a series of forearms. Riott regained control and hit the Riott Kick for the win. In the back, Paul Heyman was yelling at a backstage worker. Seth Rollins is coming up next. Seth Rollins came down to the ring. The fans broke into a “Burn It Down” chant. He talked about the last year he had. He mentioned several of his success including winning the Intercontinental Championship. He then brought up winning the Royal Rumble and punching his ticket to WrestleMania. The next night, he received 6 F-5’s from Universal Champion Brock Lesnar. Rollins noted he’s in pain from taking the F-5’s. He never felt pain like that before. The good news is he took 6 F-5’s but is still standing. If he can stand then he can fight. If he can fight then he can stomp, which means he can beat Lesnar. Rollins teased the beating could be so bad that it might be his last WrestleMania. Paul Heyman interrupted. He teased that Lesnar was there. He noted that if Rollins tries to beat Lesnar he’s going to be the architect of his own demise. Heyman noted that’s not a prediction, it’s a spoiler. Rollins said he doesn’t care. He pointed out that Lesnar has held the WWE hostage for two years. He said he’d burn in hell before he lets Lesnar leave with the title at WrestleMania. He said that’s not a prediction, that’s a spoiler. Dean Ambrose made his made to the ring. Ambrose said he’s only got on thing to say to Rollins. Slay the Beast. EC3 rocked Ambrose with a clothesline to gain an early advantage. He followed up with a missile dropkick and vertical suplex for a near fall. Ambrose fought back and sent EC3 shoulder first into the ring post. Ambrose climbed up but EC3 knocked him off. Suddenly, Ambrose used an inside cradle for the win. In the back, Alexa Bliss approached Becky Lynch. Bliss told her not to apologize later. Lynch knew what Bliss was up to. If Lynch doesn’t apologize then her spot is open at WrestleMania. Bliss told her to go out and apologize but she’ll be a sellout. Lynch noted if she apologizes the only thing she’s selling out is WrestleMania. Gable and Scott Dawson did some mat wrestling early on. Gable took out the Revival with a cross body. The faces then sent the heels to the floor. Gable followed up with a moonsault to the floor. Back from commercial, The Revival was firmly in control. Gable got the hot tag and ran wild on the heels. He sent Dash Wilder to the floor with a belly-to-belly suplex. He hit a German suplex on Dawson for a near fall. The Revival hung Gable on the top rope to take over. Gable fought back and hit a back suplex. He attempted a tag but Wilder pulled Roode off the apron. Gable hit a German suplex on Dawson but still had nobody to tag. Roode got the hot tag and ran wild on the heels. He hit a spinebuster for a close near fall. The Revival hit a Gory Bomb/Bulldog for a near fall. Roode and Gable hit a blockbuster/German suplex for another near fall but Wilder broke it up. The Revival hit a powerbomb/clothesline combo but Roode pushed Wilder into Dawson to break up the pin attempt. Gable fought back and attempted a crossbody off the second turnbuckle but Revival countered into the Shatter Machine to win the Raw tag team titles. This turned into a really good match by the end. In the back, Charley Caruso interviewed the new Raw Tag Team Champions The Revival. They bragged about finally winning the tag team titles. Becky Lynch came down to the ring to make her choice. Triple H and Stephanie McMahon also joined her in the ring. McMahon wondered if cooler heads would prevail. She noted Lynch vs. Rousey could be the biggest match in WrestleMania history. All Lynch has to do is say those two words. Hunter told her to ignore the people and shut them out. Lynch still feels that neither one of them really wants her in that match. She noted if there are just two little words she needs to say then she will. She then said I’m sorry. She noted nothing better happen to her match. They promised her they wouldn’t do anything and the match is on. Lynch was surprised it was that easy. They left the ring and Rousey came out for a face-to-face. Vince McMahon then interrupted. He noted Stephanie’s right that could be one of the biggest matches in Mania history. However, he doesn't accept her apology. Vince said he’s the man Lynch is not. Vince doesn’t like the bad attitudes that both Lynch and Rousey have. He then suspended Lynch for 60 days, which expires the day after WrestleMania. Vince has a suitable replacement in mind. He wants somebody with charm and charisma to take her place. He then introduced Rousey’s new opponent Charlotte Flair.